And the less affluent are more likely to use traditional media like radio and television. This is a very bad omen for the future of advertising on traditional radio and television. Everything is coming down to the haves and have nots in America. This is getting clearer in media. For years I’ve said the future of traditional radio is a qualitative question. Simply put those that could afford an iPhone or iPad will consume radio on-their-demand, choosing to view, read or listen when and how they want. Those that cannot afford the new gadget will be stuck with over-the-air radio. I’d often put it this way. “Every city has bus service. The reason you don’t ride the bus is you choose not to ride the bus. The people that will be left listening to radio will be those that have no other choice but to ride the bus.” Maybe this is an unfair stereotype, but it should paint a vivid picture for you and is the qualitative or quality part of the equation. The people left listening to traditional radio will not be as affluent or educated as those consuming content on their digital devices. This will be an audience less attractive to advertisers moving forward. 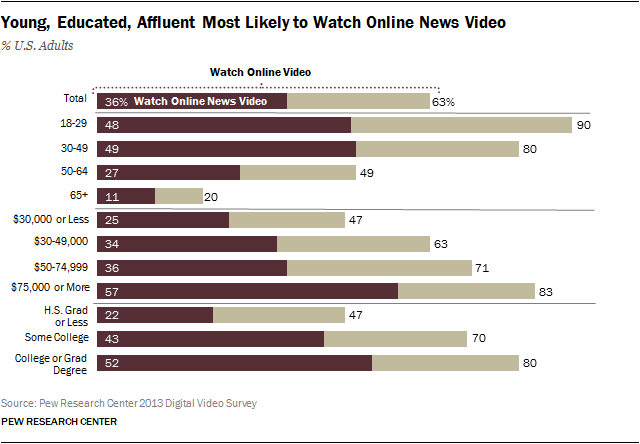 Pew Research Center has published results on how news video is being used on the web. The graph below says everything and can be equated to how traditional radio is consumed today. Just 25% of those making $30,000 or below consume news videos on the web. However, 57% of those who make $75,000 and above consume content online, using the computers, smartphones and tablets they can afford. Only 22% of those with a high school degree or less consume news video online, while 52% of those with a college or graduate degree are watching on demand on the gadgets they can afford. It comes down to those with money and those without. Those that choose not to ride the bus and those that have no other choice.